Forest Hills is an independent community in Kent County. Ada Township, Cascade Township, Grand Rapids Township and Kentwood are the areas which form the Forest Hills community. The census has a population of 20,942 for 2000. Located in the Forest Hills community is the Aquatic Center, devoted to helping its residents over their lifetime discover, continue and hold onto the recreational activities water is involved with. The Aquatic Center offers swim lessons for all ages, aquatic exercise, lifeguard training, open swim, lap swim, parent and child sessions and many more activities. The Fine Arts Center, located in the Forest Hills community, opened its doors in 2004. The mission of the Fine Arts Center is to support student programming for the Forest Hills Public Schools, such as musicals, band concerts, choir concerts, orchestra concerts and plays are just some of the programs over the past years. The Fine Arts Center has made $2,928,716 in revenue since its opening thru ticket sales, advertising, concessions, which help cover the operational costs. Grand Rapids Magazine ranked Forest Hills Schools as number ONE in Kent County, for the second year in a row. It is no wonder why the 80% of the 1,357 students from Forest Hills Central High School will obtain at least a master’s degree. Forest Hills Northern High School takes pride in their diverse student population and gives every student their chance to succeed in academics and beyond. The school districts began experiencing noticeable growth in the 1950s with Central and Northern, however they managed with the two schools by expanding them little by little. 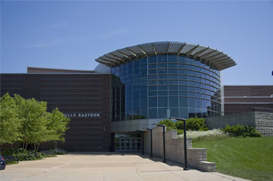 By 2002 the growth was too much and to accommodate the students Forest Hills Eastern Middle and High Schools were built in 2004, located on Pettis Ave., opening its doors to 584 eager students. The population of students is beginning to level off to be 880.